After so much interest about my breakfast nook from a photo I posted on Instagram I wanted to fill everyone in on my design and product selection for this space. Our breakfast nook is a small little jut out right off our kitchen. It serves as the "main hub" in our home. We eat 99% of our home meals here, I use it as a desk most days (I'm actually sitting on the settee as I type this blog post), and sometimes I fold laundry here. It is a small area measuring 8' x 4' and has a wall of windows that overlooks our backyard and deck. This was one of my favorite features when we first looked at this house. I loved all the natural light that poured through the windows. Here are some photos from the day we moved in. I immediately had a vision for this space- a round table and a small natural linen tufted settee. I love mixing it up when it comes to dining seating options. I have always been a fan of a settee has a dining seating option. So I just had to have one for this space and I actually ordered the settee from World Market before we even closed on the house. Which unfortunately is no longer available- but don't worry I will link a similar one at the end under the product sources. This area in our home has transformed over the 2.5 years we have lived here. I first had a long rectangle farm table the settee and 3 ladder back chairs. This look completely overpowered the space- but I was using what furniture I had right after our move. It wasn't until a few months after living in our home that I ordered our round table, which is also from World Market. And little by little I decorated and transformed this space. I added an antique plate wall- for my DIY plate wall tutorial click here. I also added a large chalk board from our wedding and placed a Magnolia wreath on it from Magnolia Market. The blue pillows are some I found at an antique store when we lived in our other house. My table center piece is a collection of items (blue mason jars and white plate)I have found over the years picking estate sales and antiques store. The small white milk glass dish was a piece handed down to me from my great grandmother. Like I said it is a true collected space. I just recently added a new chandelier and traded out my ladder back chairs for some more comfy french bistro chairs all from... you guessed it, World Market. 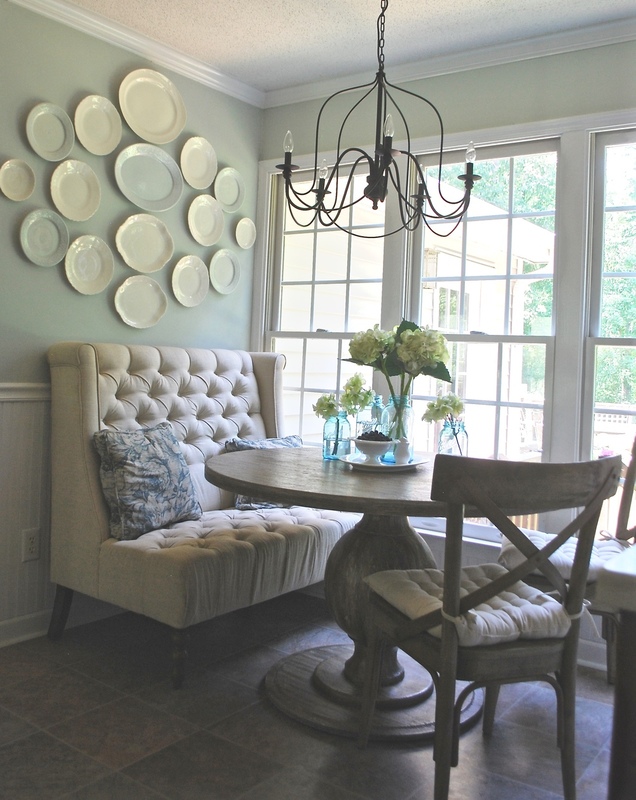 I love working and decorating spaces over time just as I did in our breakfast nook. This allows me to select items that serve a purpose and gives the space a collected cohesive style. I am so happy with this space but I'm sure I will find something else to change or add over time. I have pondered the idea of adding belgian linen curtains and a rug once I re-tile the kitchen floor. I hope this post helps with any questions you had about my breakfast nook but most of all I hope it inspires you. Stay turned and follow along as I continue updating our home. Also be sure to follow me on Facebook and Instagram for all the behind the scenes. *This post is not sponsored and all opinions any thoughts are my own- as always.